Liverpool beat Zenit 3-1 at Anfield but went out of the Europa League on away goals. 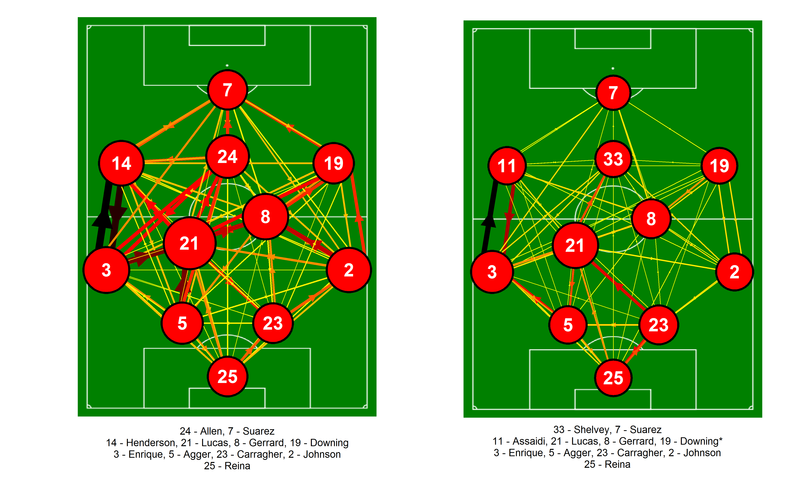 Below is the passing network analysis for Liverpool for both the first hour and the final 30 minutes of the match. This coincides with Liverpool’s sumptuous third goal and the double substitution that saw Assaidi and Shelvey replace Henderson and Allen. More information on how these passing networks are put together is available here in my previous posts on this subject. The positions of the players are loosely based on the formations played by the two teams, although some creative license is employed for clarity. It is important to note that these are fixed positions, which will not always be representative of where a player passed/received the ball. The starting eleven is shown on the pitch for the first hour, with the substitutes shown for the final 30 minutes. Sterling was only on the pitch for a brief period so I’ve omitted him from the second network. Passing networks for Liverpool for the first 60 minutes and final 30 minutes of the match against Zenit St Petersburg from the match at Anfield on the 21st February 2013. Only completed passes are shown. Darker and thicker arrows indicate more passes between each player. The player markers are sized according to their passing influence, the larger the marker, the greater their influence. Players with an * next to their name were substituted. Click on the image for a larger view. Liverpool’s initial selection circulated possession well within the midfield zone, which is perhaps unsurprising given how possession friendly the midfield was. Compared with Coutinho and Suárez in the match against Swansea, Henderson and Allen primarily look to maintain possession rather than being more direct with their approach play. This meant that Liverpool dominated possession and kept Zenit pinned back in their half generally. Enrique and Johnson were also heavily involved and provided a great deal of width. At the hub of Liverpool’s play was Lucas who knitted things together superbly and combined effectively with all of his team mates. Zenit did generally defend very well though and Liverpool struggled to create particularly incisive moves, although Allen’s goal was the result of excellent interplay between Henderson and Enrique (the strongest passing link in the first hour). Two set-piece goals from Suárez though set the platform for a potentially memorable comeback after Zenit’s away goal. Liverpool’s double substitution after the third goal saw two more direct attacking threats joining the fray as the side looked for a potential tie-winning goal. However, looking at the passing network for the last half hour, Liverpool struggled to bring their attacking players into the game. Liverpool shot frequency actually declined in this period with a succession of crosses from both open-play and set-pieces being delivered into the box. Zenit defended particularly well during this period and maintained possession for short periods to stem the tide of Liverpool attacks. They also pressed high up the pitch which saw some nervous moments in the crowd as well as the odd passage on the pitch! While the changes likely didn’t help Liverpool to any great extent, chances were still created that could have won the tie plus Zenit also boxed clever while often under a lot of pressure. Unfortunately Liverpool weren’t able to score that crucial fourth goal in the final 30 minutes that could have seen them go through. On a personal note, it was a privilege to be a part of a fantastic atmosphere at Anfield, which nearly saw an improbable comeback to add to Liverpool Football Club’s folklore. This entry was posted in Liverpool, Network Analysis, Passing and tagged Europa League, Liverpool, Network analysis, Passing, Zenit by Will Gurpinar-Morgan. Bookmark the permalink.